I previously told the story of what I characterized as a zombie piano trademark for SOHMER. The long version is here and the short version is that an owner of the mark, Burgett, Inc., had a period of non-use during which time it allowed the registrations to lapse; upon discovering the lapse another piano manufacturer, Persis International Inc., filed an intent to use application for the mark and began using it; Burgett also filed a new application for the mark; Burgett later assigned its new registration to a successor; Persis sued Burgett for trademark infringement; Burgett counterclaimed Persis for trademark infringement; the successor assigned the Burgett registration to Persis; whereupon Persis expressly abandoned the application with the language shown below, which allowed its own application to mature into a registration. Got all that? Which still leaves the infringement case between Burgett and Persis. The parties cross-moved for summary judgment on infringement for the period of overlapping use. You would think that Persis would have pretty clear sailing at this point, but not quite. What’s missing is any admission by Burgett that it abandoned the mark. The successor apparently thought so because it assigned the registration to Persis, and Persis clearly thought so from the statement in its express abandonment, but Burgett hasn’t conceded the point yet. In fact, Burgett successfully convinced the court that, while there was a cessation of use of the mark, it engaged in efforts to license the mark (indeed, one of the potential licensees was Persis) and therefore still intended to resume use of the mark. Therefore, Burgett’s SOHMER mark was not abandoned and Persis’s infringement claim failed. 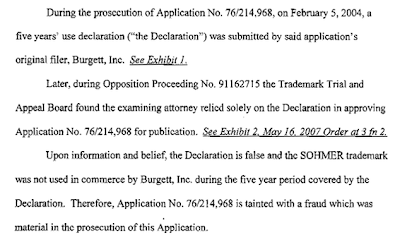 Burgett, Inc. hereby transfers all rights to causes of action and remedies related thereto including the right to sue for past, present or future infringement, misappropriation or violation of any rights relating to the SOHMER trademarks; seek injunctive or declaratory relief, and to protect any and all other rights and interest arising out of the SOHMER trademarks. 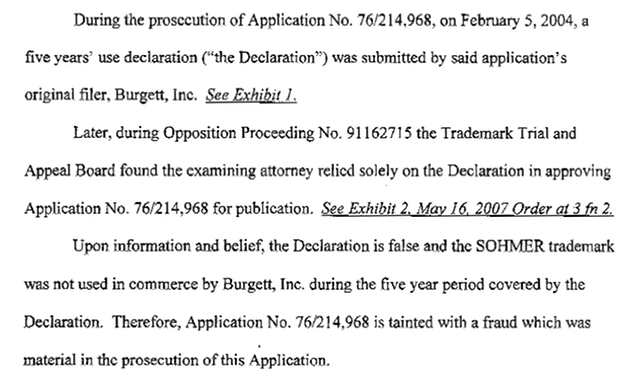 Burgett clearly gave up the right to sue for past infringement and so only was its counterclaim dismissed, Burgett was sanctioned under Rule 11 for bringing the claim. Persis Int’l, Inc. v. Burgett, Inc., No. 09 C 2751 (N.D. Ill. Sept. 18, 2012).